PPPPP. Punctual, Professional, Performance, Personable, Perfect! We made a few requests to personalize the performance. Kristy was very accommodating. She was the highlight of the evening. She deserves a definite recommendation. Kristy did a phenomenal job singing Happy Birthday to my husband. She was the hit of the party. After singing, she visited with the guests and was a true joy to meet. She has done a lot of research on Marilyn and gave us all some very interesting facts about Marilyn. She was very adaptive with just a few days notice and very pleasant to work with. She arrived at our event punctually. She sang to the birthday boy [shy and does not like attention]... and he loved it. Party guest enjoyed the show (songs, interactions). She is a true actress who expresses Marilyn's wittiness and charm. Her voice is incredible. I would recommend her highly. Veterans Homecare Solutions clients and staff are beyond thankful for your classy and sincere tribute act that you performed for us on May 24th for our first annual Memorial Tribute Show in Pineville, LA. In fact, we believe Marilyn Monroe herself would be proud to know that her name is being held with such dignity and honor. Thank you so much for coming out on such short notice and we look forward to working with you again in the near future. Talk about a Classy line up of Professional Tribute Artists'. 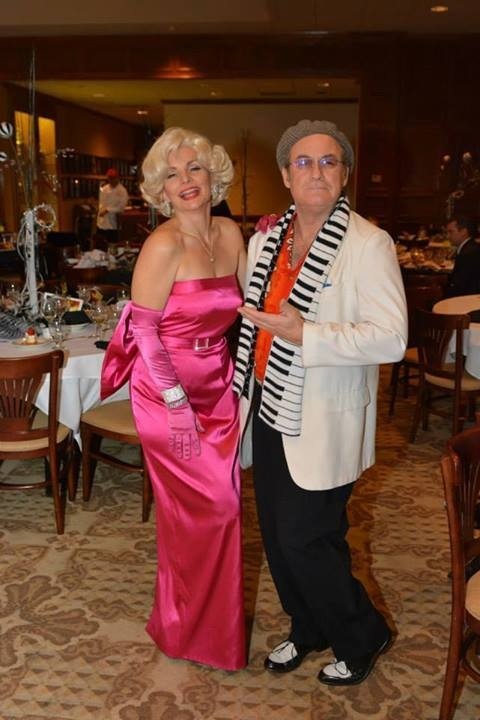 Bill Johnson as Bob Hope, Kristy Casey as Marilyn Monroe and Levi Silver as Elvis Presley. Here goes the play by play of this performance best as I could remember.